Beginning in 2017, Copy Cat, the genetic replica of leading sire High Brow Cat, will be available for breeding at an introductory stud fee of $4,000. The stallion will stand at Weatherford Equine. Katrin Hinrichs, Professor and Patsy Link Chair in Mare Reproductive Studies at Texas A&M, cloned Copy Cat from genetic material harvested from High Brow Cat to create an exact reproductive replica. Copy Cat, foaled in 2013, has been labeled by scientists as being the “purest of equine clones” due to the unique process of his cloning. 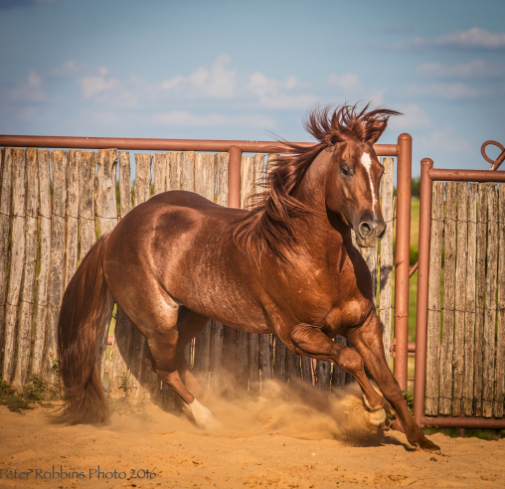 An oocyte harvested from a maternal relative of High Brow Cat’s dam, Smart Little Kitty, is what sets the process apart from other cloned horses and raises such genetic integrity to a higher level. Weatherford Equine’s Dr. Justin Ritthaler has overseen the breeding of High Brow Cat for the past 10 years. He was involved in the cloning process of High Brow Cat and will now oversee Copy Cat’s breeding as well. He believes the young sire to have great reproductive potential. “He looks a lot like Cat. He is conformationally correct and is just as personable as High Brow Cat. As a foal, he developed normally and has no health issues whatsoever. Copy Cat will be at Weatherford Equine, and I encourage anyone interested in breeding to him to please come by and check him out”. To date, High Brow Cat’s offspring have been shown to more than $72 million in earnings. The sire has also produced an unprecedented eight NCHA Open Futurity Champions, the highest paying accolade in the industry. Owner Darren Blanton of Colt Ventures has hopes of Copy Cat continuing High Brow Cat’s legacy. Currently the AQHA does not register clones. Registration is available through the American DNA Registry which shows proof of ownership and ownership history, as well as age and genetic verification. The NCHA does not require horses to be registered to compete. For more information on High Brow Cat or Copy Cat, contact Colt Ventures: (940) 748-2610; breeding@coltventures.com.